I was just so curious when actually people start using cell phones and how first cell phone look like? To find my answers I start digging web and came up with this article, hope you will like it! It’s hard to imagine that once the hand held light weight device through which we can communicate throughout the world was a rarity just couple of decades of ago. Cell phones are integral part of our lives styles now and we rarely leave our homes or offices without it. The cell phones we see today have an interesting history; it all actually started couple of centuries ago when our fore-fathers were thinking that long distance communication could only be done my snail mails. It takes a few men of vision to spread their dreams globally so it all really started with one man Samuel Morse. In 1832, Samuel Morse conceived the idea of electromagnetic telegraph and laid down experimental version of his idea. Then in 1842, he laid wires between Governor’s Island and Castle Garden, New York, a distance of about a mile. Half of circuitry was underwater that got broke when passing ship pulled up the cables, many speculated the end of his dream and yet Samuel Morse didn’t give up and proceeded without the cable and successfully managed to introduce first ever wireless transmission by conduction to the world. And then the ideas started pouring in, new possibilities emerged when Michael Faraday, an analytical chemist, started an exhaustive research on space conducting electricity and then in 1865 Dr. Mahlon Loomis was the first person to communicate through wireless via atmosphere. He was the one who developed the method of transmitting and receiving messages through earth atmosphere. That was the beginning for cell phones. 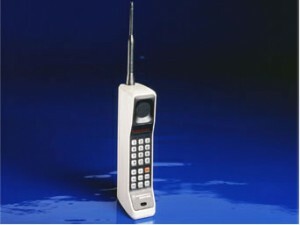 This rectangle box you’re seeing right now was the first commercial cell phone that became available in 1983. Then it cost $3995, weighted two pounds. Talking time was 35 minutes and for that, phone had to be charge for ten hours! Thankfully cell phones have improved a lot since then. You can see various images of old phones here. It’s a wonder to see how quickly technology has changed the face of the cell phone in little time. Initially there was limited coverage and too much static filled but in 1980, cell phone quickly started to overcome it’s hurdle as proper standards and regulations were set. Inner circuitry became more powerful and smaller, making the possibility of smaller and lighter cell phone a reality. In 1990s when transmission of cellular phone went from analog to digital, quality of communication improved. With emergence of pre-paid phone accounts, cell phones truly become popular because that made this communication technology affordable for everyone. 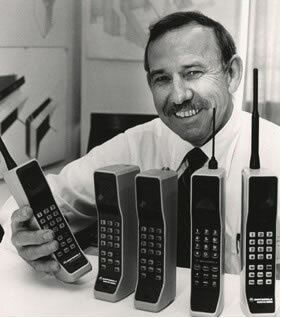 The best thing about the evolution of cell phones is that its not over yet. Plenty of changes happened, plenty are happening and there are plenty of new ideas that are surging around that one day become an important part of cell phones.